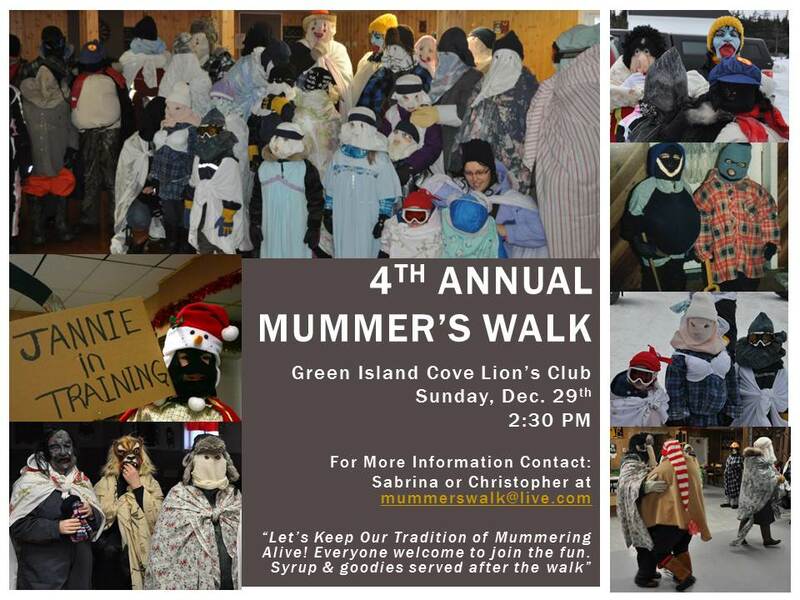 The Mummer’s Walk was initially held in Flower’s Cove on December 29th, 2010. This event was created from dialogue between local Anchor Point native Sabrina Gaulton and I to encourage locals to continue our valued traditions. It was always a goal that this would lead to an annual event and also include a mummer’s dance and a night of mummer in each community. The Flower’s Cove event was well received and much fun. It included a walk, some dancing at the Lion’s Club and a few treats of hot chocolate, purity syrup and some jam jams. The tradition continued to Anchor Point in 2011, where my friends from Switzerland and Germany also got to participate in our rural tradition. It was a windy day, but still kids and adults alike dressed up and enjoyed the event. In 2012, the festivities were held at Savage Cove, which drew more than 40 mummer’s, nearly doubling past events. Also, there was a Mummer’s Dance held too! This year we are excited to announce the annual event will take place at the Green Island Cove Lion’s Club on 29th of December at 2:30 PM. Young and old are encouraged from all communities to come out and show your traditional spirit to join the merry band of mummers. Posted on December 10, 2013, in Announcements, Tradition and tagged christmas, Christopher Mitchelmore, janny, mummer, mummer's walk, mummering, The Straits White Bay North. Bookmark the permalink. 1 Comment.